Have you been to the bumper car pavilion at Glen Echo Park? (Some of us have done modern dance there. Others of us grew up nearby.) It’s road trip time. 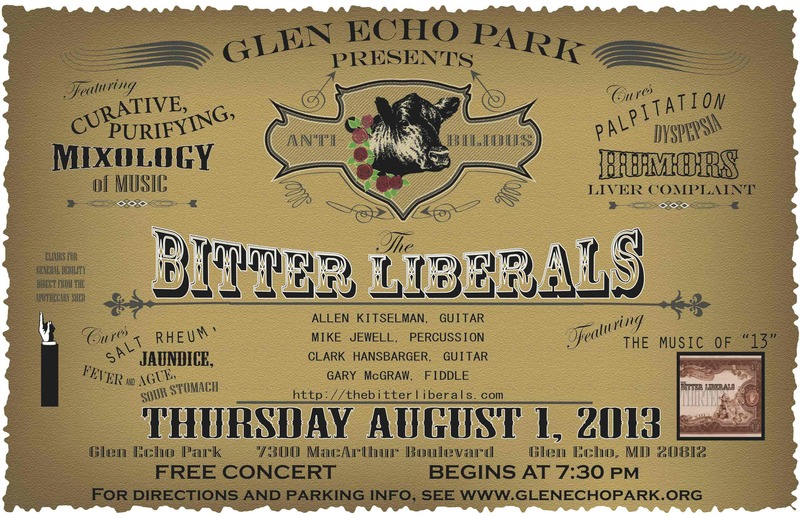 Well, the Bitter Liberals would love to have you and your urban friends join us for a special FREE concert at Glen Echo park on August 1st. Tell everyone you know in Washington to come hear us (especially those Tacoma Park people)! It’s a Thursday. It’s near the city. It’s free. What more reasons do you need? Please convince your city mouse friends to come see us. And come yourself! We will surely appreciate it. Copies of our CD 13 will be available for sale. This entry was posted in 13, band, bitter liberals, CD, gig, original music and tagged 13, CD, concert, conga, entertainment, fiddle, free, glen echo md, glen echo park, guitar, mike jewell, music. Bookmark the permalink.